For greater back support, our Pro Kayak package features two Tall Back Seats, and bow and stern storage bags for longer trips. High-performance AB40 Paddles increase power and reduce fatigue. Tackle your adventures in tandem. The 380x is made to be ridden by one or two persons. Now you can do what others only dream of with our most versatile kayak series ever! Designed to tackle whitewater, open-water, and now down-wind sailing! Large enough for two but small enough for one! The 380x does it all! When the 16 rapid self-bailing drain valves are open, you are sure to drain off water as quickly as it enters! With the drain valves closed you are certain to remain high and dry when paddling on flat waters such as lakes, bays and other bodies of water. The unique modular design of the Sea Eagle Explorer™ features a super rigid, high pressure, drop stitch floor that sits on top of an outside floor. This has several advantages. The high pressure DS floor provides great rigidity and super responsive paddling performance. The reinforced outside fabric floor provides a double layer of added protection so it can bounce off rocks, logs and other objects you may hit in whitewater. 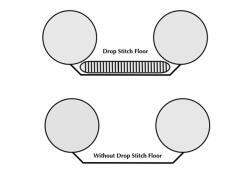 The modular design allows the DS floor to be easily removed for quick and thorough cleaning. A nice feature of this design is that the skeg can be removed with the Explorer inflated or deflated. 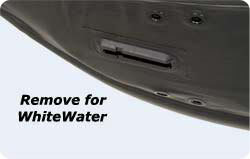 Simply remove it for whitewater adventures (eliminating it as an obstruction)and replace it for flat water to reduce yawing (swinging to the right or left). 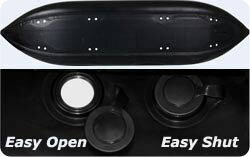 This increases track-ability during long flat-water touring, maximizing efficiency. We use high-pressure fabric for our high-performance Explorer Kayaks, FastTrack Kayaks, PaddleSkis, Frameless Pontoon Boat, FoldCats, SailCat, Yacht Tender, and Sport Runabouts. The 1,000 denier woven base cloth gives tremendous strength and the PVC coating on both sides creates a waterproof, air-tight seal. Tough-as-nails Supported Fabric – Our tightly-woven base cloth is coated with several layers of a special polymer then fed through rollers under great pressure to force the coatings into the fabric creating a solid, waterproof, very tough material. 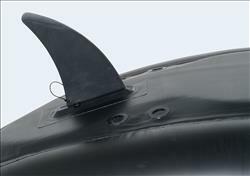 Omnidirectional Strength – Our high-performance boats can endure severe impact with sharp objects without puncturing. The fabric isn’t just tough; it has equal tear-resistance in all directions. Quadruple Overlap Seams – We overlap all main seams with an additional layer of material above AND below for a total of 4 layers. At 36 mil each, the 4 layers together are nearly 144 mil thick — thicker than most other inflatables. Long life additives – Our 1,000 denier high performance fabric is formulated with special additives to guarantee long term resistance to ultraviolet (UV) rays, gasoline, oil, and other chemicals. 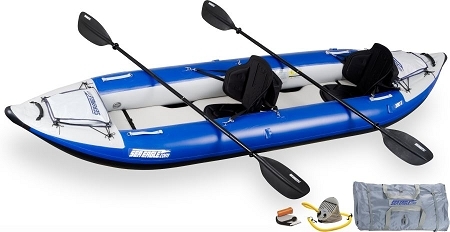 For greater back support, our Pro Kayak package features two Tall Back Seats, and bow and stern storage bags for longer trips. High-performance AB40 Paddles increase power and reduce fatigue. Includes 3 Year Manufacturers Warranty against defects.